Bricks with a gray cast can be either a cool true gray color or a warm brownish gray. Match the temperature of your bricks to the temperature of your primary color and neutrals for the best gray brick exterior color schemes. Five Great Gray Brick Exterior Color Schemes. A timeless palette of black and white works well with a great range of brick colors. Bright white calls attention to architectural details while a toned down white lets other elements stand out. The aged look of Black Oak marries well with the style of Rockwell brick. A grayed tan ties the two together, warmer tan accents the colors in the brick, and a dark color on the door finish the scheme. Bring out the beauty of a brick like Augusta with a tonal palette for the roof, main body, and trim. Highlight the deepest tones in the Tahoe roof and brick with an eye-catching copper colored front door. Pair a two-tone brick with a single-tone roof to allow the pair to harmonize rather than compete for attention. Cool paint colors such as gray or blue highlight the gray in both. Bricks with a subtle blend of tones can inspire your scheme. Don’t try to match too closely. The result will be more pleasing if you choose colors that appear to blend with the brick when standing back from your home. 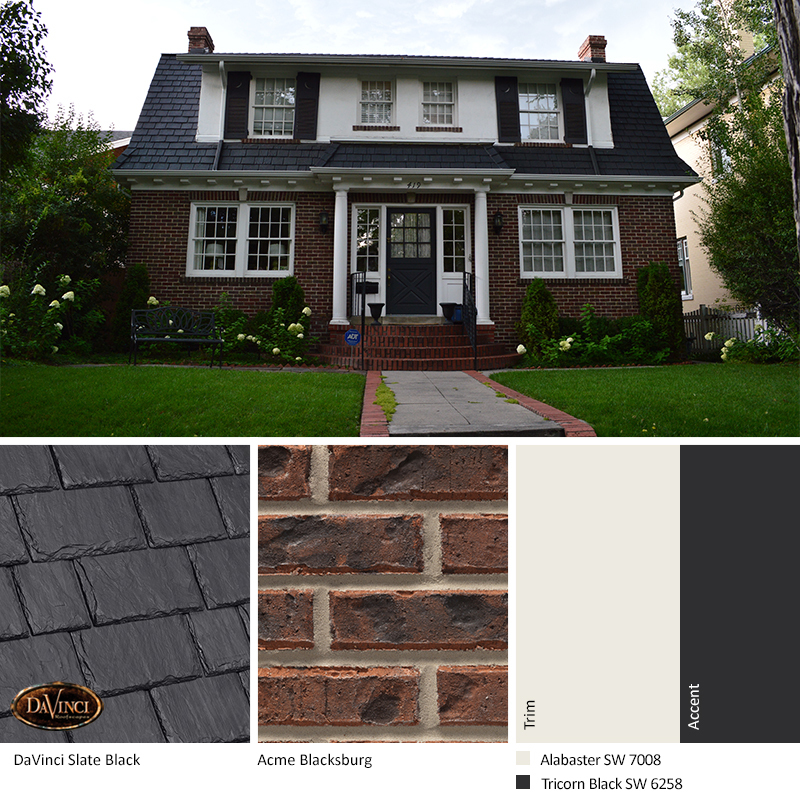 By following the tips above you can find a color palette to create beautiful gray brick exterior color schemes. Then for even more helpful information, download our complete guide to select gray brick exterior color schemes – FRESH Home Exterior Color Schemes for Brick and Stone.